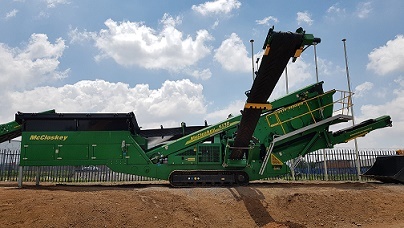 HPE Africa’s extensive range of McCloskey crushing and screening equipment, encompasses mobile screeners, which offers high output, durability and extended service life, in the most demanding conditions. McCloskey International’s S-Series and R-Series screeners, are designed with a high energy screenbox, with the largest screening areas in their class, for high productivity. “The S130 screener – a popular model in McCloskey’s fleet of versatile screeners – is known globally for fine sand screening, high production capacities and user-friendly operation. Extensive on-site testing indicates that these compact machines offer comparable productivity with competitor models of a larger class,” says Rasheel Sukdhoe, McCloskey product manager, HPE Africa – exclusive distributors locally, for McCloskey International. “Another high point, is these flexible machines – available with either track or wheel mobility – are suitable for efficiently handling many different materials, aggregate, coal, crusher circuits and wood chips. This robust machine, which is powered by a 75 kW diesel engine, comprises screenbox dimensions of 4 200 x 1 524 mm which is designed to meet demands of operators who require significantly more screening capacity than a 10’ or 11’ screenbox, but may not require the higher capacity of a 20’ plant. Other notable features of the S130 include remote-control grid-tipping and a wedge-system, designed for faster screen changes. The hydraulic linkage structure enables optimum screen coverage at varying screenbox angles, also allowing greater accessibility for screen changes. The hopper has a 4 267 mm grid opening, to accommodate the use of larger loading shovels for quicker and more efficient operation. The 1 200 mm feed conveyor of this machine ensures high capacity screening. Stockpile heights of 3,87 m and 4.6 m can be achieved with the tail conveyor and with a side conveyor respectively. McCloskey S130 screeners have features for enhanced safety that include an emergency stop facility and a start-up siren. External belt alignment and grease points enable quick and easy maintenance. HPE Africa’s comprehensive range of McCloskey equipment includes jaw, cone and impact (horizontal and vertical) crushers; trommel and vibrating screeners, stacking conveyors and washing systems. According to Alex Ackron, managing director, HPE Africa, this equipment is suitable for use in diverse applications, including aggregates. landscaping, infrastructure and road building, construction and demolition, mining, waste management and recycling. HPE Africa – which is also the exclusive distributor locally for Hyundai Construction Equipment and Soosan hydraulic hammers and quick couplers – provides an essential support service, that encompasses a technical advisory, repair, maintenance and parts facility.